Bracelet in platinum with aquamarines and diamonds, Tiffany & Co.
With colours evoking clear and calm turquoise waters, it’s no wonder that aquamarine derived its name from the Latin phrase “aqua marina”, which means “water of the sea”. The ancient Romans believed that aquamarines could ward off stormy weather and bring peace when sailing. Legend also has it that mermaids hid aquamarines in treasure chests and offered them to sailors in distress. Recognised as the March birthstone, the water-esque gem has a long history in jewellery. First discovered in 1811 (on record), it enjoyed a surge in popularity in the late 19th century as it was used extensively in Art Nouveau and Art Deco jewellery. Queen Elizabeth II has been spotted several times wearing the gem, most significantly in a parure made by Mappin & Webb. The set, comprising a ring, a necklace and a bracelet, was a coronation gift from the Brazilian government in 1953. The next year, the Brazilian government also gifted Eleanor Roosevelt an aquamarine weighing a staggering 1,298ct. The Queen is not the only British royal accessorising with aquamarine. Meghan Markle, too, has been spotted wearing the precious stone. In fact, she set off a flurry for it after she emerged at her post-wedding evening reception sporting an aquamarine ring that once belonged to Prince Harry’s late mother Princess Diana. Made by British jeweller Asprey, the ring – emerald-cut aquamarine surrounded by diamonds – was specially commissioned by Princess Diana in the late 1990s. In 2018, Bvlgari made aquamarine the main gem in its Divas’ Dream collection necklace, while Tiffany & Co. introduced mixed-cut aquamarines totalling 61cts in the stunning Blue Ice necklace – worn by Gal Gadot at the 90th Academy Awards – from its Blue Book collection. Boucheron got an early start on the trend in 2017, when it unveiled its Baïkal necklace, a showstopping collar-like piece with an oval, 78.33ct Santa Maria aquamarine at its centre. A behind-the-scenes moment with Wonder Woman @gal_gadot before this year’s #Oscars. Blue Ice Necklace and Blue Ice choker from #TiffanyBlueBook. Aquamarine is a cyan variant of the beryl crystal. Its startling clear blue hues, with the occasional green tinges, are due to the presence of iron impurities in the originally colourless beryl. The colours range from light, almost transparent teals to deeper blues. The stone’s hardness, rated 7.5 to 8 on the Mohs scale, makes it durable enough to withstand different experimental cuts and everyday wear. Mention aquamarines and the name Martha Rocha comes to mind. The eponymous stone was discovered in 1954 in the Brazilian state of Minas Gerais, weighing approximately 34kg; it went on to yield gems totalling 57,200ct. The colour was of the richest and most intense shades of blue ever seen and hence, was named after Martha Rocha, the then-Miss Brazil who was famous for her blue eyes. The world’s largest piece of cut-gem aquamarine to date is the Dom Pedro, mined in Minas Gerais in the late 1980s and named after Brazil’s first emperor and his namesake son. Currently on display at the Smithsonian Institution’s National Museum of Natural History, the obelisk-shaped gem designed by renowned German gem cutter Bernd Munsteiner weighs 10,363ct and stands at 35cm tall. Brazil is the best known source of aquamarines of the highest quality and most gorgeous colours. It has produced two historically significant ones – the intensely hued Santa Maria from the Santa Maria de Itabira mine, and the Espirito Santo, also named after its state of origin. These are just two significant ones that come to mind. Aquamarine is also mined in other countries, including Nigeria, Zambia, the US, Pakistan and Madagascar. Pakistan aquamarines are known to be vividly clear, while Madagascar yields aquamarines with a medium blue hue. The intensity of the gem’s colour and the purity of the stone decides its value; brightly coloured aquamarines with no inclusions fetch higher prices, hence many gems on the market are heat-treated to achieve a deeper and clearer colour without green traces. Aquamarines with a cat’s eye effect, where a band of light that bisects the stone is seen clearly from all angles, are rare and valuable; those that exhibit asterism, where inclusions of rutile needles reflect light in a star pattern, are even more so. 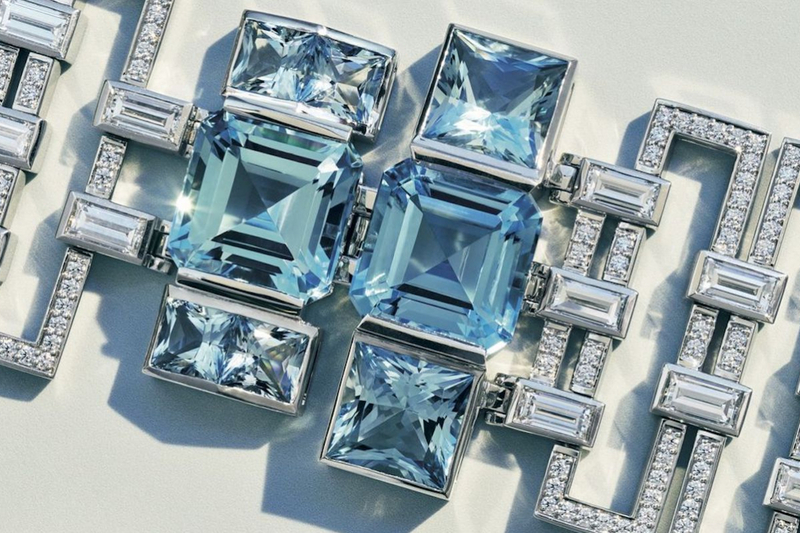 In June 2014, Christie’s New York auctioned off a pair of Cartier Art Deco earrings in platinum with diamonds and hexagonal-, rectangular-, old European- and oval-cut aquamarines at US$353,000, exceeding its US$100,000 high estimate. More recently, in June 2018, a Tiffany & Co. bracelet designed for Peggy Rockefeller by Jean Schlumberger, in platinum and gold with five rectangular-cut aquamarines (totalling 97.55ct) and diamonds, sold for US$250,000, surpassing its US$60,000 high estimate.